Who is it for? 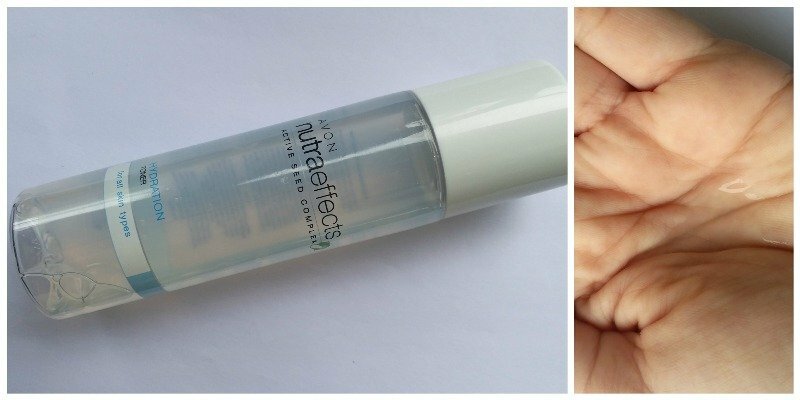 Avon Nutra Effects Toner is a toner for individuals with all skin types but being a hydration toner it will be more than useful for people with dry to combination skin. The toner comes in a solid plastic bottle with a screw on cap. The product is dispensed through a plastic cover with a hole which helps control the amount of toner to pour on the cotton pad. The product comes out as a slightly thick liquid and is absolutely transparent in color. The product feels like water on application but is a tad bit sticky for a second after application which goes away as soon as it absorbs in the skin. The toner almost has no fragrance at all when applied to the face but if you take a whiff from the bottle itself it has a very mild pleasant fragrance. This is a good toner which gives a boost of extra hydration without drying out the skin. Having no fragrance unlike a lot of toners makes me want to use it more often. The toner is a good addition to the skincare routine but I haven’t seen any major difference with my skin by using the toner accept a small amount of hydration. This is a decent toner which is available at a good price. It doesn’t do anything spectacular for the skin but for the quantity and price, it can surely be bought.